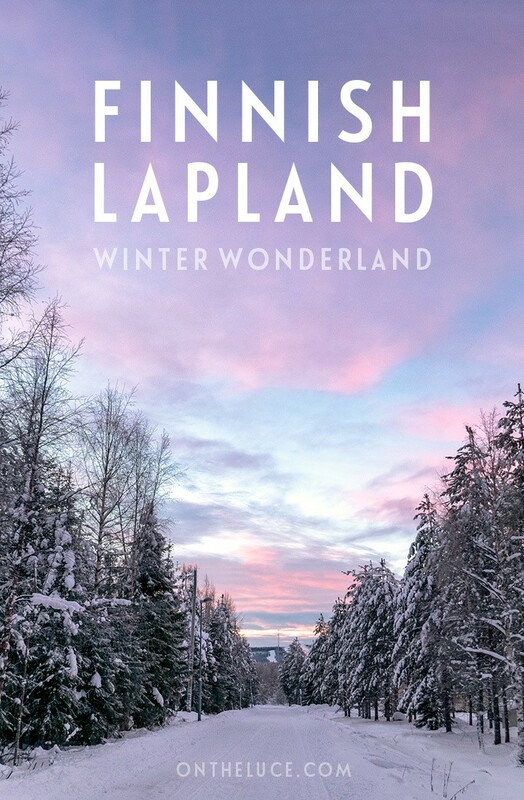 A winter wonderland of pink skies, husky sleds, frosty fir trees, steaming hot chocolate and twinkling lights – Finnish Lapland is where all your snow-filled fantasies come to life. And right at the heart of it is Rovaniemi, perched on the edge of the Arctic Circle and the official home of Santa Claus (and he’s got to know the best place to live). From the Northern Lights to reindeer sleigh rides, the winter months in the far north are full of magic, and my first Arctic adventure more than lived up to expectations. 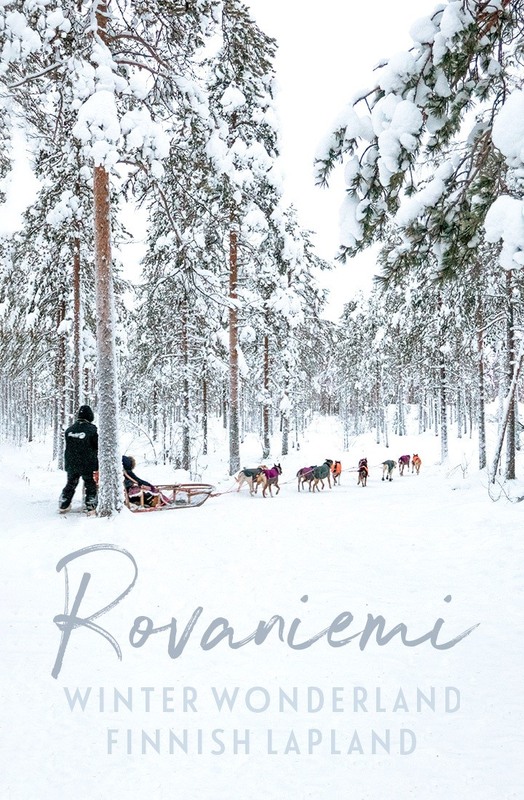 So here’s how to plan a winter trip to Rovaniemi. The two big questions we had about visiting Lapland in January were how cold is is going to be and is it going to be dark all the time? The sun rises just before 11am and sets at 2pm in early January, but that doesn’t mean it’s pitch black the rest of the day. It’s twilight between 9.30am and 3.30pm so you can still see and there are beautiful long sunrises and sunsets. Rovaniemi’s weather did hit an icy -24°C/-11°F at one point, but daytime temperatures were usually around average with highs of -10°C/14°F and lows of -18°C/0°F at night. 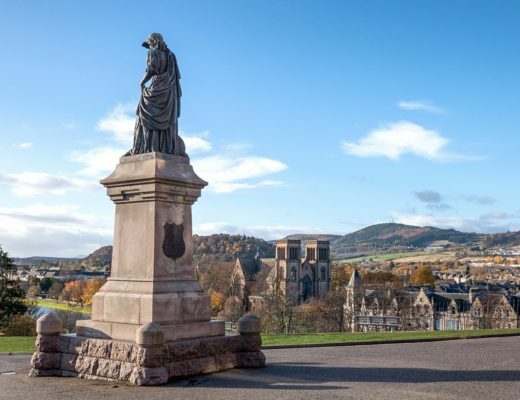 It might sound scarily chilly, but if you’ve grown up with damp British winters, this crisp, icy cold doesn’t penetrate in quite the same way. And if you’re covered up in a good set of winter clothing (see below for what to pack) and head inside to warm up every now and then, it’s bearable. Most visitors to Rovaniemi stay in one of two main areas. 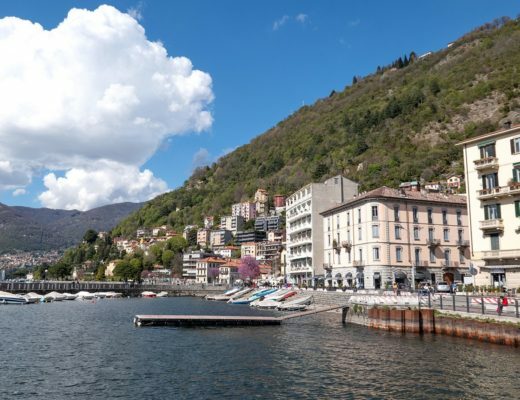 There’s the city centre which has a good selection of hotels and holiday rentals. 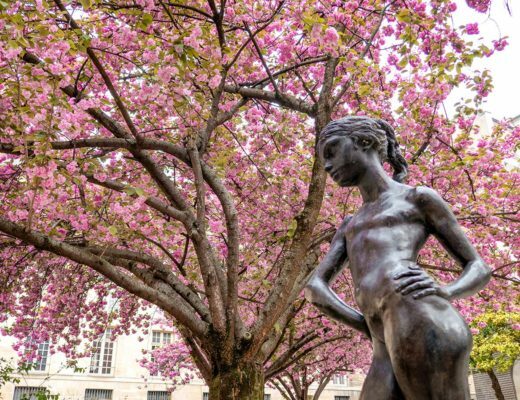 The bonus is you have easy access to shops, restaurants and transport, but you’re in a city so it’s not quite the full idyllic winter experience. Or you can head outside the city, which is where you’ll find that snowy forest scenery, and where there’s less light pollution so you’re more likely to see the Northern Lights. 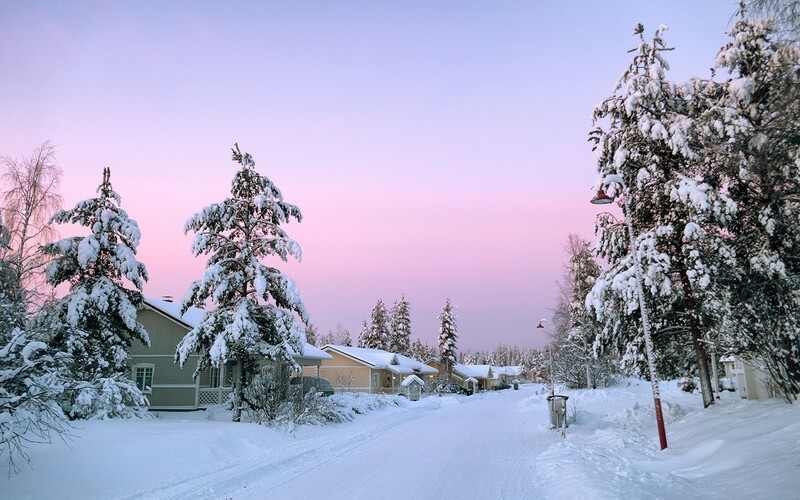 Santa Claus Holiday Village is one of the biggest accommodation areas outside the city – it’s around 4km from the airport and 8km from Rovaniemi city centre. It’s a popular place to stay as there are lots of activities on site (including the man himself). There’s various accommodation, from some stunning glass igloos and treehouse cabins to standard wooden cottages. 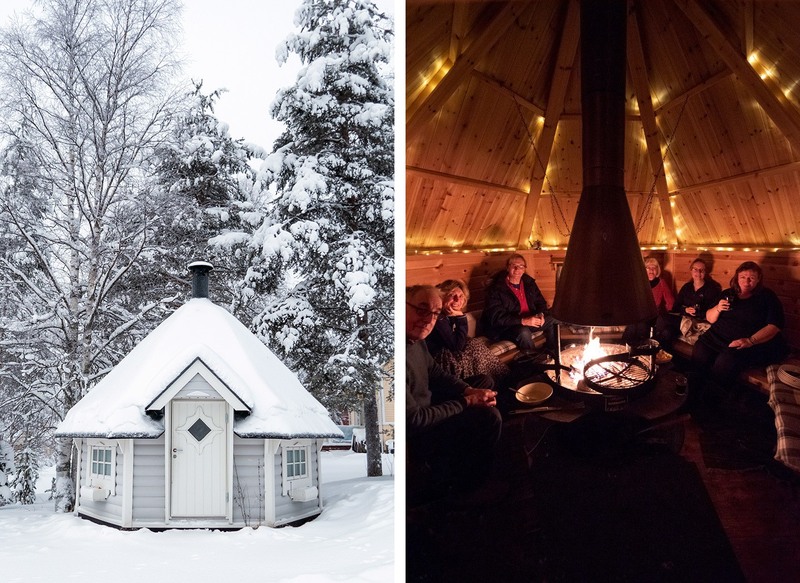 But the igloos will set you back €860 a night and even a cottage for two adults and two children costs €1100 for four nights B&B. So with a group of eight of us it was going to be pricey. Another option is to rent a property privately – there are plenty of places available through sites like AirBnB. We found a five-bedroom house which sleeps 11 people for €1800 for four nights, but there are different-sized rental apartments and houses around the same area too. The house is only a 10-minute walk from Santa Claus Village so we didn’t need to hire a car. 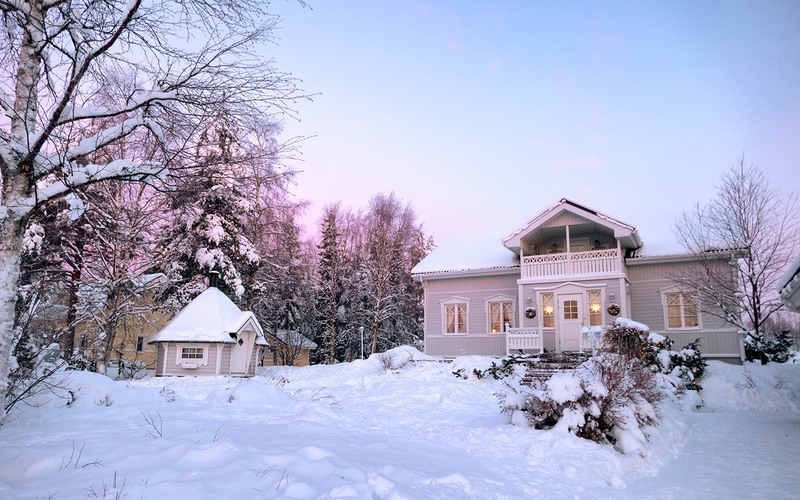 The family live there most of the year so it’s got a homely feel, with a well-equipped kitchen so we could self-cater if we wanted to (eating and drinking out is expensive in Lapland). Nights in the north are long so it was good to have somewhere warm to cosy up, with underfloor heating, a fire, sauna and a brilliant BBQ hut in the garden where we cooked salmon over the fire. 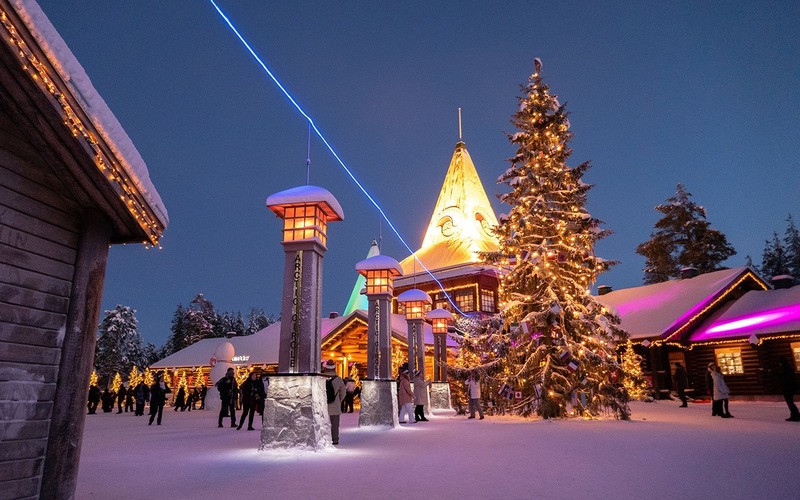 Santa Claus Village is the epicentre of all things festive in Rovaniemi (even right into March) and there are a ton of wintery activities you can do on site, making it an easy place to base yourself if you’ve only got a few days in Lapland and don’t want to spend your time travelling around. The park gets super busy in the run up to Christmas, but things calm down after the New Year – making it a good time to visit. But what is there to do in Santa Claus Village? I thought Santa would be off to the Bahamas as soon as Christmas is over, but you can visit him in the Santa Claus Office all year round. There’s also a Post Office where you can send letters with a special Arctic Circle postmark, and a Christmas exhibition. Yes this place really does go all out for the festive season. The line of the Arctic Circle also runs right through the middle of the village – you can see it marked with a row of lanterns and strip of blue lights. 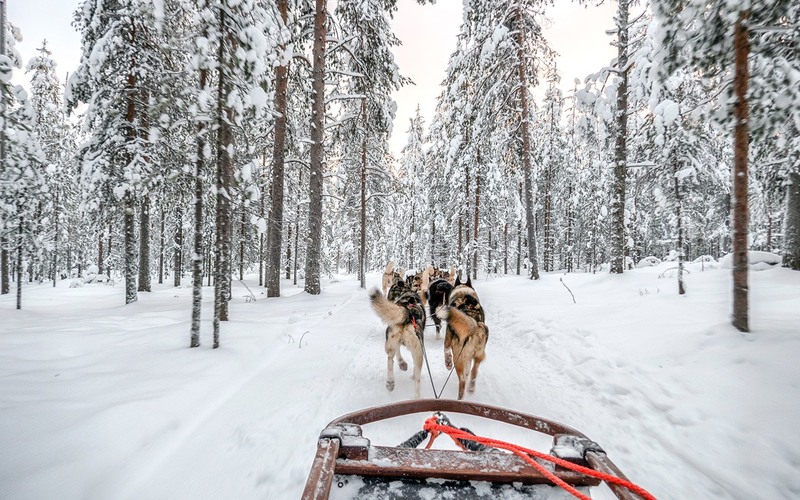 Speeding through the snowy forest behind a team of Siberian Huskies was one of my must-dos for my trip to Rovaniemi, and it didn’t disappoint. 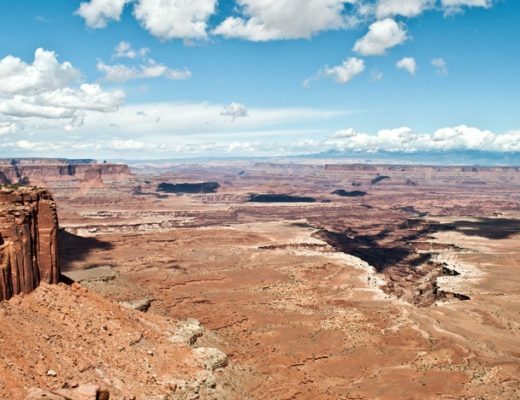 There are various different lengths of route you can take, from a short 500 metres to eight kilometres. But these guys can really move, so hold on to your hats (literally) as the ride soon whizzes past (and the cold wind is brutal at top speed so wrap up warm). 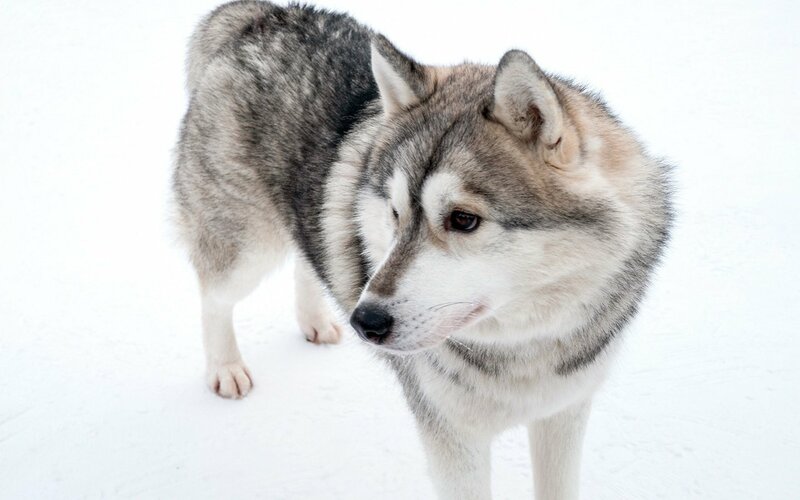 Whether you’re taking a husky sled ride or not, you can visit the Husky Park where you can meet and stroke some of the park’s gorgeous dogs. If you want to actually see the scenery, a reindeer sleigh ride is a lot more sedate and relaxed, and a chance to get up close to these amazing creatures. Like the husky sledding, there are various different lengths of circuit available so you can decide how far you want to go – we went for 15 minute Forest Path which took us through fir trees piled up with snow. 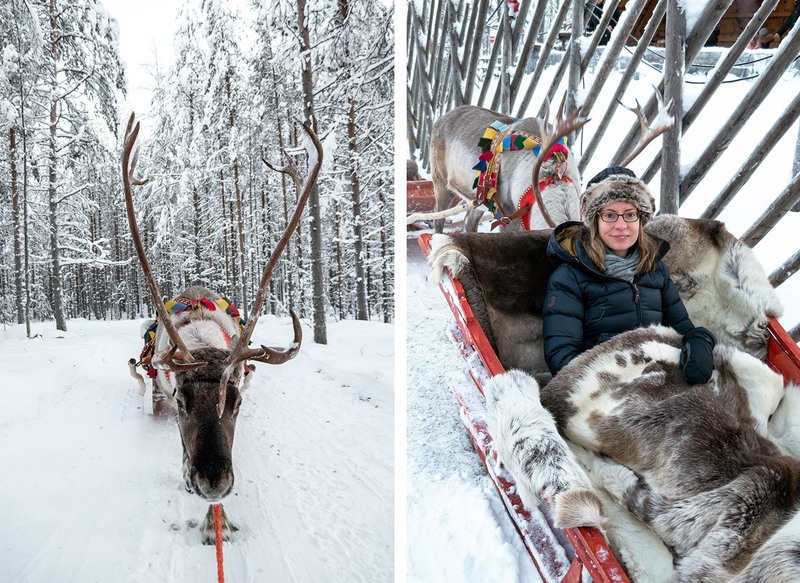 Sleighs can hold up to two adults and you’re wrapped up in reindeer hides so you stay nice and warm. A castle for five-metre tall Moomins made out of snow? Only in Finland. The Moomins are a bit of a Finnish institution, with a family of white creatures that look a bit like hippos, based on the books by illustrator Tove Jansson. 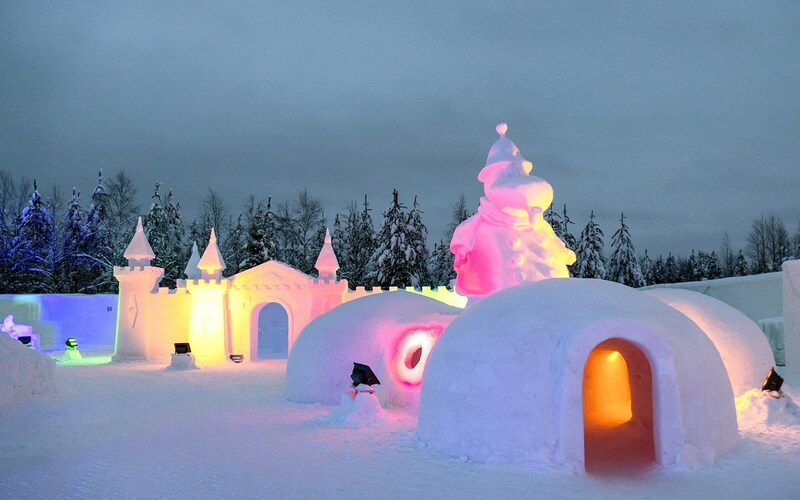 The Moomin Snow Castle is a new development this winter season, and it covers a huge 10,000 square meters, with a mini maze, igloos, an ice bar and a couple of sledge runs, as well as a lot of enormous Moomins carved out of snow and ice. 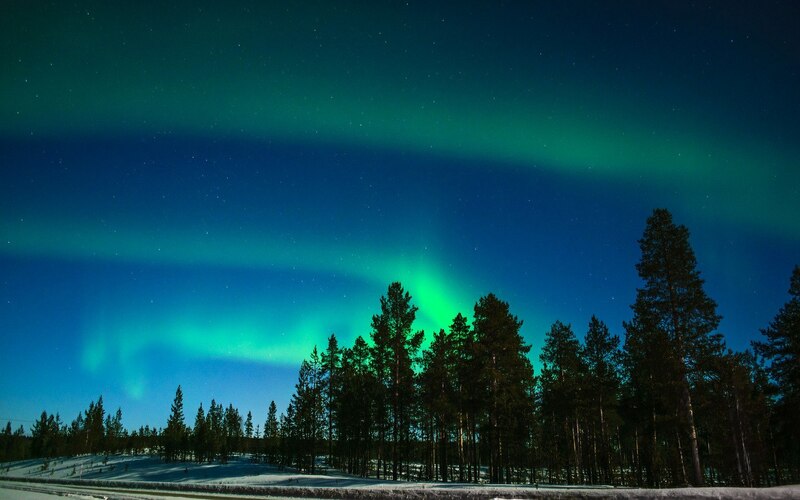 The Northern Lights – or Aurora Borealis – are one of the big reasons that people come to Lapland. But it’s also the one thing you can’t guarantee you’re going to see. You need the right atmospheric conditions, which happen around 150 days a year on average in Rovaniemi – but unfortunately not while we were there (I guess it gives me a reason to go back). If you want to try aurora hunting there are lots of tours, or you can download an alert app like Aurora Alert or Northern Lights Alert if you don’t want to stand outside all night just in case. 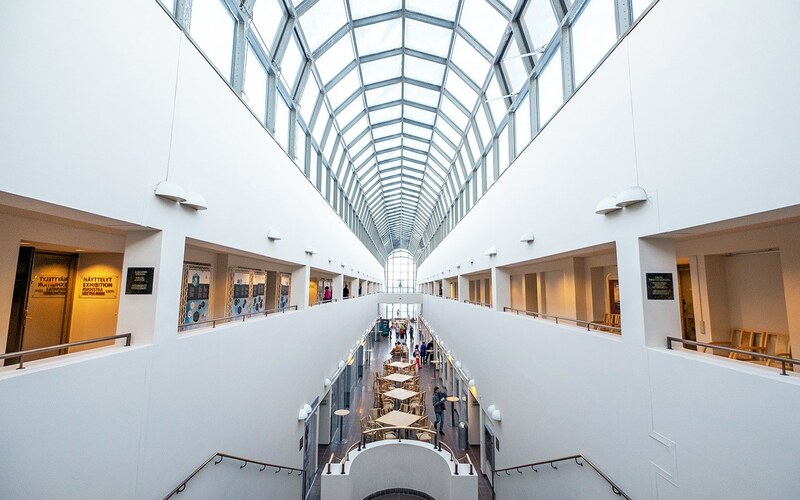 Even if you’re not staying in the city, it’s worth heading into Rovaniemi for a look around. One of the main attractions is Arktikum, a museum and science centre in an amazing modern building overlooking the river. It’s split into two sides, with natural history on one side and cultural history on the other, so you can find out about the people and landscapes of the Arctic Circle. There are also some good restaurants in Rovaniemi where you can try Lappish food. 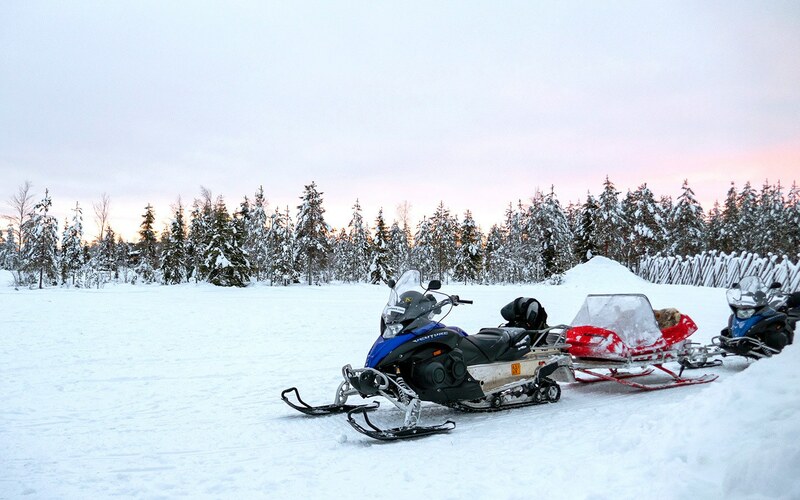 If you fancy something a bit more adrenalin-fuelled, Santa Claus Village also has a snowmobile centre (but you need a driving license if you want to drive one yourself). Or you can try snowshoeing, cross-country skiing, ice fishing and even ice swimming if you’re feeling brave (or crazy). 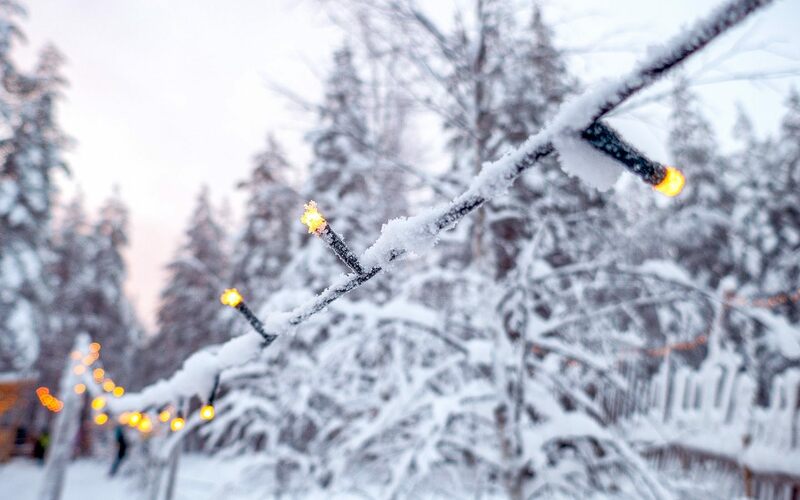 But for us the best bit was just wandering around in the snow – there are forest areas around the village which are perfect for making snow angels or having a snowball fight. 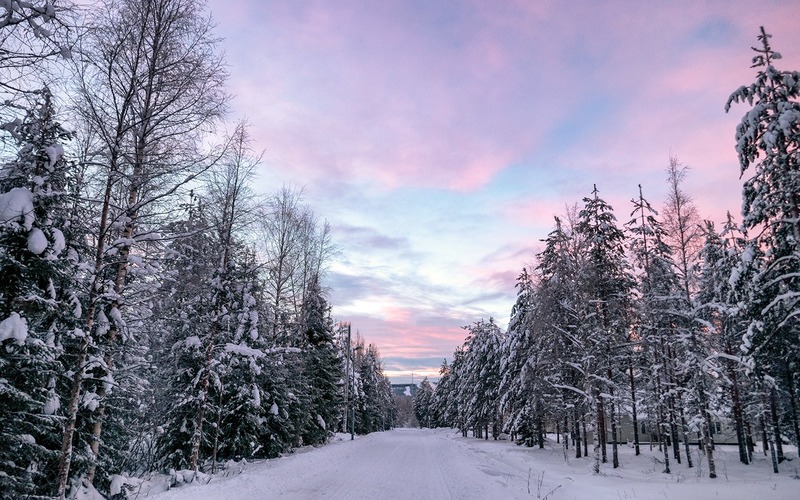 There are international flights to Rovaniemi from London Gatwick (with easyJet and Norwegian) and Paris Orly, as well as domestic flights from Helsinki, from where you can connect to flights all over the world. Or you can travel to Lapland by train from Helsinki either by taking an eight-hour daytime train or by catching the overnight sleeper train. You can hire a car at the airport, but if you don’t fancy driving in the snow (main roads are kept fairly clear but other drivers are pretty fast!) there are buses and taxis. The Santa’s Express bus connects the airport, Santa Claus Village and city centre, and the no 8 bus runs from Santa Claus Village to the city centre and railway station. Or taxis costs around €2 per kilometre. Getting kitted up for extreme cold is all about layering. Start with a base layer of thermals, with a long-sleeved top and leggings/long johns. Then add a fleece or woolly jumper, a pair of waterproof ski trousers and a warm coat (I just invested in a Rab coat but any ski jacket or thick down coat would work). Add ski socks and snow boots or other warm waterproof boots. Finally add a scarf, hat and gloves (I used two pairs, a thin wool pair plus ski mittens). Hand warmers are a really good idea – tuck a pair inside your gloves so they stay warm if you have to take them off, and if it’s really cold you can put them inside your boots too. Keep your phone and camera close to your body as the cold will drain the battery fast. And take tissues (your nose will run from the cold), lip balm and a good moisturiser as the air’s very dry. Looks lovely and the temps are the same as Alberta, Canada. If you dress appropriately, it would be just fine. The right clothing does make such a difference. I always get cold hands (too much taking my gloves off to take photos!) so the handwarmers were brilliant. Really enjoyed reading this Lucy. It’s got me excited all over again for my forthcoming trip to Norway! 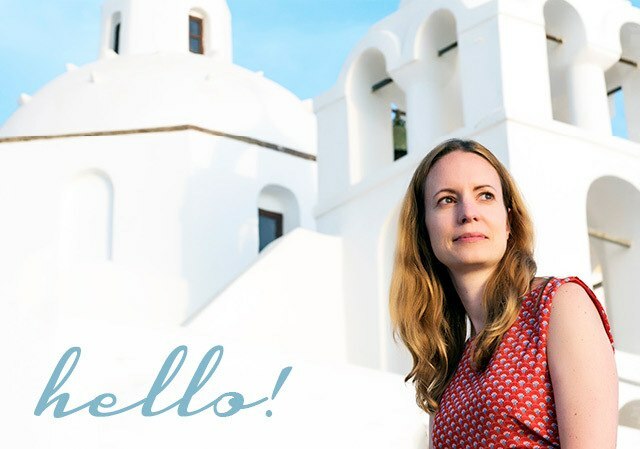 Have an amazing time – look forward to reading about it! 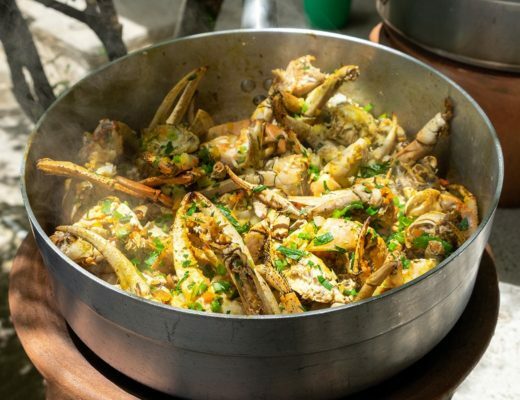 You’re welcome – it would be a brilliant one to do with kids, so many magical experiences! It really was magical – I’m definitely a convert to winter trips. I’m sold. January 2020 here I come! Brilliant! Keep an eye out for bargain flights too, we got ours for £100 return with easyJet as it was a new route and we booked super early, but it was over £350 by the time we went. This sounds like the dream winter break! What a magical place Rovaniemi is! Looks absolutely amazing! Would love to go some day. Love the sounds of long sunrises and sunsets… they’re over too quickly elsewhere! I love sunrises but never normally manage to get up for them but this made it a lot easier! Aww looks amazing Lucy! Im trying to decide whether to go husky sledding in North iceland next month – the prices Im seeing are SO expensive! How much was it to do in Rovaniemi? We only did a very short trip – 10 mins was €40 per person though and a 5km/30 mins trip €100 per person so it is pretty pricey! We happened to be in Lapland just a few days before you travelling with Tui for a 3 day visit. We stayed about 1.5 hours north of Rovaniemi. We managed to take a reindeer ride, snowmobiling and trying out husky rides. A simply stunning place. Would love to head even further north and try and chase the Northern Lights. It is a brilliant place! Fingers crossed we’ll both get to see the Northern Lights next time. Love your stories and photography Lucy.